Yes, your home router could indeed be letting your Second Life experience down, and a couple quite common series of routers are among the most culpable. I’ll start by pointing out that the IEEE 802.11 networking standards aren’t the easiest set of networking protocols to implement correctly in device firmware. It’s all too easy to get them almost right, resulting in wireless access points and routers that work just fine for some kinds of workloads and that fall down spectacularly for others. As a bonus, RFC-2663 IPv4 Network Address Translation is also a commonly poorly-implemented feature in many network devices. 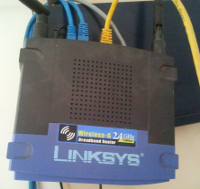 In my experiences from 2000 to 2005, the vast majority of wireless access-points/routers of that period – while just fine for Aunt Tilley and her Facebook habit – turned out to be duds (ranging from extraordinary failure to far more subtle symptoms) once you hooked up a power-user or a small three or four person office. They might choke and die, they might toss stations off at random, they might just run some connections very slowly, or some might unpredictably stall, leaving you wondering. Finding good hardware during that period was a chore, and it hasn’t gotten that much better since, in my opinion. Often the best you can hope for is “just good enough” (if you’re lucky) unless you use something like a dedicated Linux system as a firewall and router. Even such networking giants as Cisco Systems has gotten them wrong on occasion. Few (if any) manufacturers seem to be entirely exempt from glitches in these particular standards implementations. All that said, Linden Lab has recently been performing somewhat extensive testing of consumer routers as a part of Project Shining, and come up with two common series that are already problematic with Second Life. One year and one week ago, Second Life’s age-verification was changed to asking you your date-of-birth. This week, there’s been a tiny tweak. It only asks you once, instead of twice. Technically, it isn’t “age-verification” anymore, either, and that terminology seems to be on the way out.